Light It Up Blue at AU Katzen lit up in blue for autism awareness. 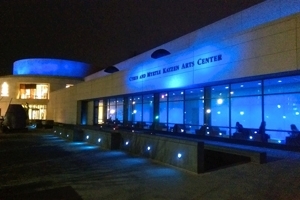 On Thursday, April 2, the Katzen Arts Center went blue for World Autism Awareness Day (WAAD). The Katzen joined more than 16,000 buildings across the world that were lit up in blue to help shine a light on autism, including The Empire State Building, One World Trade Center, The Great Sphinx and Great Pyramids of Giza, The Old Parliament Building, and the Taipei 101 Tower. At AU, the effort was coordinated by the Iota Phi chapter of the Alpha Xi Delta sorority in partnership with Autism Speaks, the world's largest autism advocacy organization. Autism is a complex brain disorder that inhibits a person's ability to communicate and develop social relationships, and is often accompanied by behavioral challenges. Autism spectrum disorders are diagnosed in 1-in-68 children in the United States, affecting four times as many boys as girls. The prevalence of autism has increased tenfold in the last decade. World Autism Awareness Day, celebrated each year on April 2, was adopted by the United Nations in 2007 to shine a bright light on autism as a growing global health crisis. Autism is one of only three health issues to be recognized with its own day by the United Nations. WAAD activities increase world knowledge of autism and impart information about the importance of early diagnosis and early intervention. What's in Store for Progressive Politics in 2020?